Based on the 2009 blockbuster movie of the same title, follow sleuth extraordinaire Sherlock Holmes and his assistant Dr John Watson through late Victorian London. Sherlock Holmes: The Hunt for Blackwood is a video pokie game by IGT. Put on your detective cap and play this five-reeled, 30 payline pokie. Collect clues and cash prizes as you go on the hunt for the villainous Lord Blackwood. 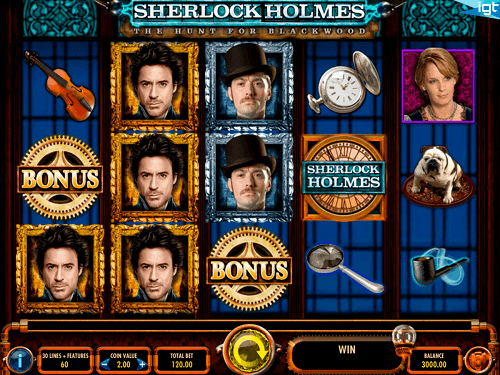 IGT gives this recycled theme a fresh twist with high-quality graphics that depict Holmes and Dr Watson (portrayed by the actors in the film Robert Downey Jr and Jude Law). The game is set in Sherlock Holmes’ home on 221B Baker Street. Sherlock Holmes’ legendary items – his smoking pipe, magnifying glass, pocket watch, violin, and English bulldog – are the low paying symbols. Holmes, Dr Watson, Mary Watson, and Inspector Lestrade from Scotland Yard are the high paying symbols. Sherlock Holmes: The Hunt for Blackwood comes with multiple bonus features that keep you hooked for hours. The base game has random mystery multipliers that reward you on any spin. These multipliers range from two to ten times your winnings. However, these multipliers tend to land on the low paying symbols. Keep your eye on the pocket watch – the random multipliers tend to land on this symbol. If you manage to get stacked Dr Watson and Sherlock symbols, this triggers the Teamwork feature. It appears randomly and if you trigger this feature while you’ve still got mystery multipliers, you can possibly make up to 1 000 times your bet. Stack four Holmes symbols with a ten times multiplier, you can get up to 425 times your original bet in the base game. There’s also the Puzzle Picker bonus feature which is triggered when you get three scatter symbols on reels one, three, and five at the same time. During this feature, you’ll have five picks to choose objects in the sleuth’s room to reveal clues. The Puzzle Picker feature rewards you with cash prizes, up to two bonus features, and up to 15 free spins. Another bonus feature is the Blackwood Wheel bonus feature where you collect wheels and attempt to evade Lord Blackwood. There’s a lot going on in Sherlock Holmes: The Hunt for Blackwood pokie. With three bonus feature rounds and random mystery multipliers, there’s never a dull moment. It pays out and keeps you on the edge of your seat as you and Lord Blackwood engage in a game of outsmarts and hunting for cash prizes.